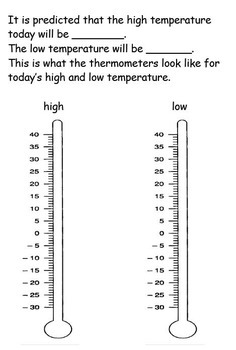 My Weather and Temperature Book is perfect for a week of looking at predictions of temperature and weather using a metric thermometer in degrees Celsius. Tie in media by looking at the weather forecast in newspapers, on the internet, weather channel or iphone. Examine how accurate the forecasts are. Updated April 2015. 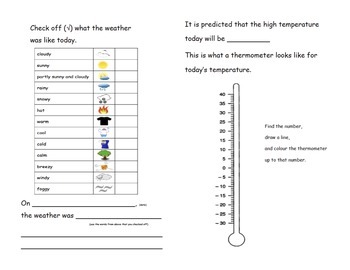 Children record the date, use a checklist for the weather, print the weather (spelling provided), record the temperature using a thermometer as a number line, colour the thermometer and record favourite type of weather, favourite activity and clothing to wear over the 5 days. Copy the pages as many times as you like to extend the 5 days into a few weeks. Instructions for copying and assembling book in download preview. 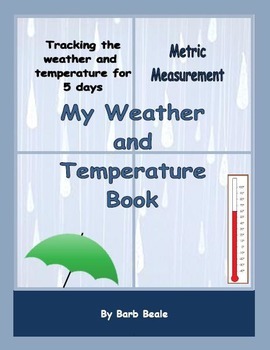 You might also be interested in my Measuring Temperature book available in My Store.